Employees in today’s digital workplace use an average of three different devices in their daily routine, which will increase to five or six devices as wearable technologies become more common. Are businesses happy about all the devices at their employees’ fingertips? Statistics don’t tell if they’re all smiles or not, but it looks like the acceptance rate is going up. Seventy-four percent of organizations are either already using or planning to allow employees to bring their own devices to work. 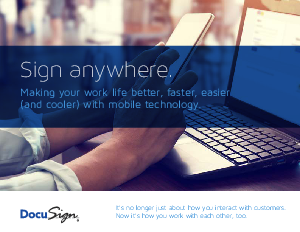 Prepare, send, and execute documents for approval and signature – As easily as if on a large desktop or laptop monitor. Do business even when offline – Legal and binding approvals and signatures can be made, stored, and later downloaded and actionable when wifi is available.